Scooter & Scout are very playful & energetic. Scooter & Scout: the curiosity before the pounce. 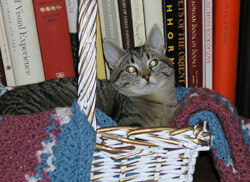 Scooter cuddling in the kitty basket. 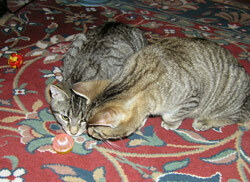 Scout & Scooter are adorable & super-friendly brothers who are looking for a loving forever home. These wonderful fellas are very outgoing & well-adjusted, especially considering their difficult origins. Poor Scout & Scooter were found on the side of the road in Middleburg, VA by a woman driving by. They were in a box with their mother & two other siblings. The kind lady took them home & set them up in her tack room. She took them to the vet for a check up & found homes for the other siblings & mama. Since they were healthy, she brought Scout & Scooter into her house. Life was good. However, things change; a divorce occurred. The lady & the cats were ousted from their home. Scout & Scooter came to CR!FR to find a loving happy permanent home. Scout & Scooter are very healthy & are now about 2 years old. They're neutered & up-to-date on their shots. 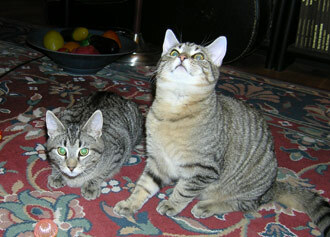 While they may look like twins, Scout is a golden brown tabby & Scooter is a black-brown tabby. 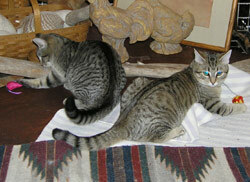 They are very active & are great companioins. Scout & Scooter get along ok with foster mom Sharron's dog & cats & but can be a little dominant at times. They are very sweet, loving & trusting. If you are looking for affectionate, friendly & playful kittens who like alternating between lap cats & playful tigers these are your boys.